Here is a whimsical version of the 17 hexomino shapes that make up the Cornucopia puzzle designed by Stewart Coffin. Stewart selected just 17 shapes from the full 35-piece set of hexominoes (our Sextillions set), omitting any straight, symmetrical or chunky (containing a 2x2) piece. Dan Klarskov has styled and handcrafted each piece to resemble a different animal, done in three kinds of wood. Dan is a puzzle lover and woodworker from Denmark. 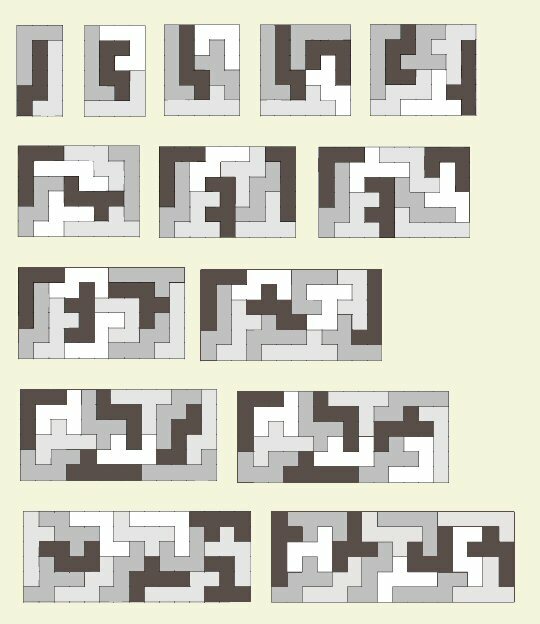 See more of Dan's puzzles on his website. Dan's specialty is making "step" puzzles that progress from the smallest to the longest rectangle. You can see the notches in the edges of the tray, for inserting a bar to block off sections step by step, starting with just 3 easy pieces and ending with the full tray. These progressively stretched Cornucopia rectangles are always 6 units high and their width is equal to the number of pieces used. Solutions for all sizes, from 3x6 to 17x6, were found by Dan and Kate Jones. Below is one of many possible progressions from 3 to 16. The 17x6 is shown above. The different colors of the pieces are arranged for contrast only, not invariable.